I recently read a quote by Salvador Dali that said: “Have no fear of perfection – you’ll never reach it.” That really struck me and made me think about how important is it to forgive yourself when trying to achieve perfection since nothing is perfect and we are all just a work in progress. We shouldn’t expect too much of ourselves, and our standards in perfection are not set in stone: they’re different from one individual to another, constantly changing over the years. Perfection is out there – it inspires and guides us towards a journey full of experiences that help us improve ourselves while recognizing our flaws. Just know that it will always be out of reach. 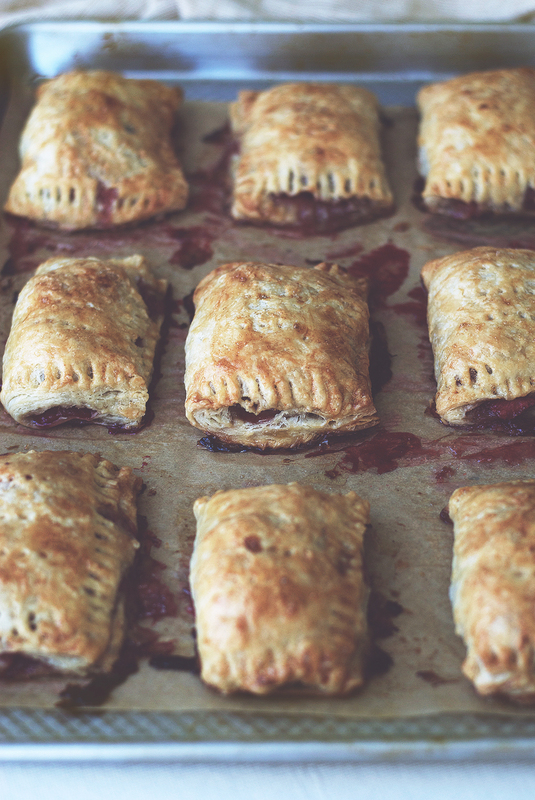 I was hesitant about posting these handmade strawberry rhubarb hand pie pictures because they’re not “perfect” by my standards. Some of of the pies are barely sealed others are oozing out the filling but they tasted really good. It’s all about that tender, flaky crust that puffs up into beautiful layers. 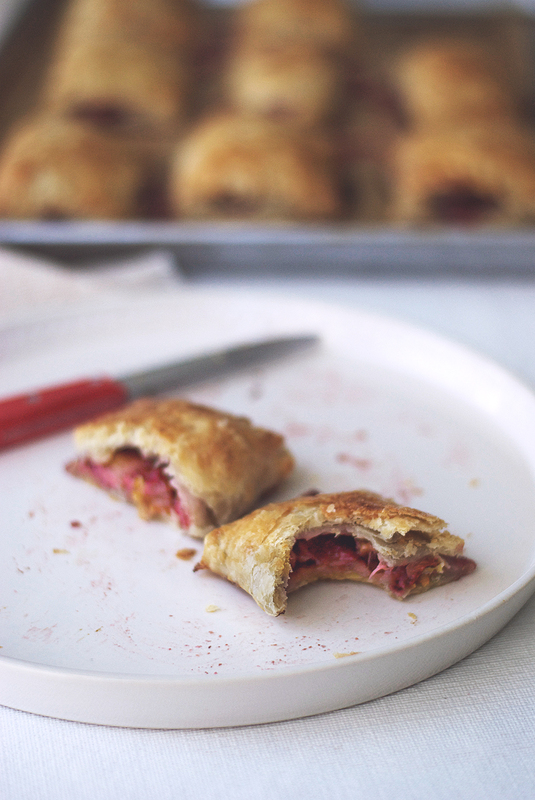 I’ve always been fascinated by rhubarb and I love using these tall red celery looking stalks in baked goods. 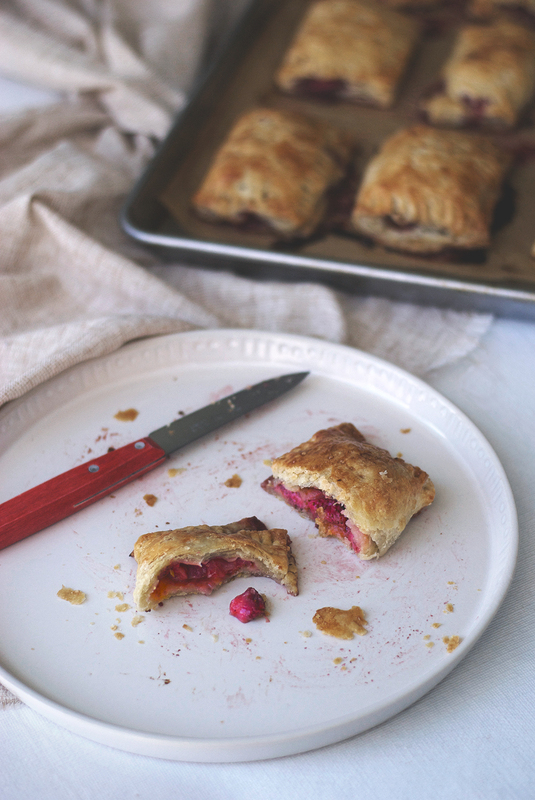 The ratio of crust in these hand pies is much higher that the filling so you’ll definitely get more crust in each bite especially considering that rhubarb shrinks a lot when baking, much more than strawberries. Just don’t try to overstuff the pies because you’ll end up with messy and runny pies like mine, but hey– there’s always beauty in imperfection. 1. Stir the flour, sugar, and salt in a large bowl. Add the butter pieces and cut the butter into the flour mixture using a pastry cutter. Work quickly until mostly pea-sized pieces of butter remain. 2. Combine the water, cider vinegar, and ice in a large measuring cup. Sprinkle two tablespoons of the ice water mixture over the flour mixture, and mix with a bench scraper until fully incorporated. Add more of the ice water mixture, 1 to 2 tablespoons at a time, using the bench scraper or your hands (or both) to mix until the dough comes together in a ball, with some dry bits remaining. 3. Divide the dough into two flat disks, wrap in plastic wrap, and refrigerate for at least 1 hour, preferably overnight, to give the crust time to mellow. 4. Prepare the filling by combining the rhubarb, strawberries, sugar, cornstarch, cinnamon, and salt in a large bowl, toss to combine then stir in egg. Place in the fridge. 6. Generously flour your work surface. Place one chilled, unwrapped dough on the flour, keeping the other disk refrigerated while you work. Gently roll your dough out from the center until about 1/4 inch thick. Cut dough into six 4″x5″ rectangles. Gather dough scraps, and shape into rectangles as well. If the dough becomes difficult to work with at any point, chill for a few minutes in the freezer on a baking sheet before continuing. 7. Line a baking sheet with parchment paper. Lay rectangles on parchment lined baking sheet. Lightly beat egg with milk for egg wash in a small bowl. 8. Brush edges of rectangles with wash, place 1-2 tbsp. filling in center of each rectangle. Fold one short side of dough over the other, encasing the filling. Crimp edges using a fork. 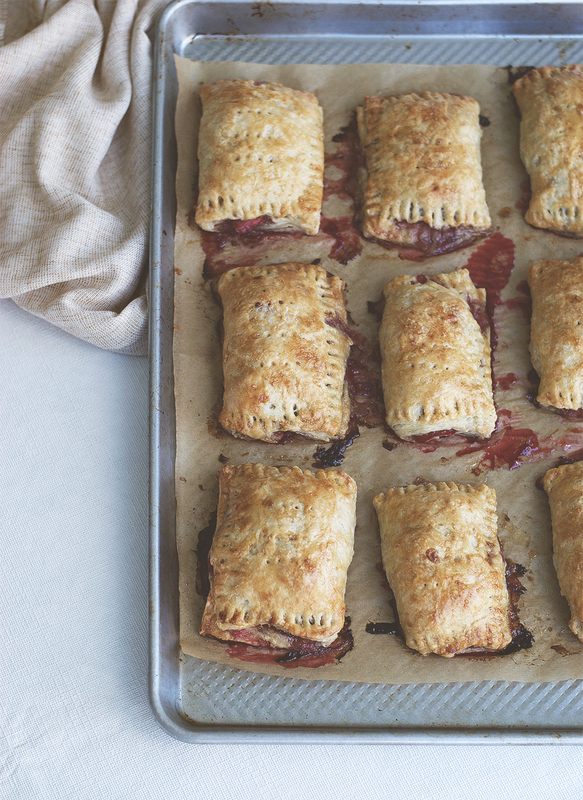 Transfer pies to parchment paper-lined baking sheets and chill 20 minutes. 9. Brush with egg wash, and sprinkle with raw sugar. Cut slits with a knife or prick tops with a fork. 10. Repeat with other disc of dough and remaining filling. 11. Place baking sheet in oven and bake until pies are golden, about 30-35 minutes; let cool on wire rack before serving.